To determine if you have 1/4" or 5/8" radius corner hinges, measure from the beginning of the curve to where the corner of the hinge would be if it was square. 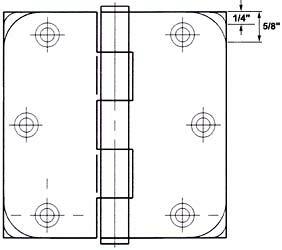 1-3/8" Door to 32" 3-1/2"
1-3/8" Door 32" to 36" 4"
1-3/4" Door to 36" 4-1/2"
1-3/4" Door 36" to 48" 5"
1-3/4" Door over 48" 6"
Top hinge 5" from jamb rabbet to top edge of barrel. 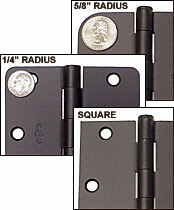 As a general rule you will want to use 1 hinge per every 30" of door or fraction thereof. Referring to door height: Doors up to 60" - 2 hinges, doors over 60" but not over 90" - 3 hinges, doors over 90" but not over 120" - 4 hinges.